App Builder Appy Pie, February 9, 2018: Why is it that we as mobile app developers or app publishers fail to take into account the matter of app accessibility? This blog will talk about what accessibility means, how does it translate into the world of mobile apps, and a special checklist that you as an app developer must take into account if you intend to develop an app that is accessible. It is a strange thing, we all know about app accessibility, and we know what it entails yet we do little to nothing about it and rarely do we implement it in our apps. Is it that difficult or are we that complacent about it! Let’s begin by understanding what accessibility really means. Accessibility is the underlying principle that a design must follow in order to make the product usable by people with any form or measure of disability. Disabilities in the context of mobile apps may include visual, hearing, motor, or cognitive disability and we will get into the details in a bit. What needs to be understood is that on the basis of the functionality of your app, the solutions it provides, and the users you are targeting, you may have to provide accessibility support to some or all of these disabilities. In the world of web, accessibility has been around now for quite some time, two decades actually. In its initial years of development, even the internet and hardware innovations were still underway. This effectively meant that most of the efforts were still being diverted towards getting the machinery and the websites to function properly and little to no attention was paid to accessibility and ergonomics. As the world of websites has matured, a number of government and organizational mandates have been put in place that have made accessibility for web compulsory. The point is, as web app developers or publishers, should we wait for that long? Should we wait for an authority of some sort to mandate it, when it is obvious that making apps accessible is going to bring in great returns for the app, the business, and of course the users! Which disabilities do you have to cater to? In context of mobile apps, like we mentioned before, the types of disabilities that we need to consider, are the following. Anyone with varying degrees of blindness or vision impairment would fall under this category, including the people who are suffering from color-blindness. Anyone who has any measure of hearing disability or impairment, is deaf or is hard of hearing would fall in this category. Those who have an inability to use the mouse or have slow response to actions or situations or have limited fine motor control. This might even affect the ability to tap at the right spot on the screen. Those who suffer from learning disabilities, have weak or impaired memory, and are unable to focus on large amounts of information. When you set out to design your app, these disabilities must be taken under consideration and you must endeavor to come up with an app design that is inclusive of all these people who fall in these categories. For example, color blindness that affects 1 in 12 men and 1 in 200 women makes it impossible for those who are affected to look at colors in the same way. When you have a design that doesn’t take this factor into consideration, you are failing to cater to this cumulative population. Here’s a list of probable considerations you must look into while designing your app. For visually disabled people you will have to convert any kind of content into text with a voiceover. People who are partially blind would need the contrast levels to be altered and you might also do well to offer them a screen reader for magnification. For the colorblind, incorporate a way which would enable them to differentiate between colors. For those who are deaf either provide subtitles or incorporate sign language in the app. People with hearing impairment would be able to use your app if you offered them a clearer and louder audio. People who have impaired movement can be catered to, if you let them use voice input or some other variation for input. When you are designing for people with cognitive disabilities, you would need to design your app in simple layouts that are clear and are consistent. If your app has elements with flashing lights or imagery, allow the users with epilepsy to disable them. When you design an app that takes care of these considerations and concerns you are bringing everyone on a common, neutral and fair ground, and you are going to do that with just your app! Why should you make your apps accessible? Sometimes the task of considering all these disabilities while designing or developing your app might seem like a daunting task, but there are some reasons that will motivate you to get to it! According to WHO, 15% of the world’s population lives with some or the other form of disability and when you do not cater to them, you are losing out on a huge chunk of the potential market. Alternatively consider this figure, 57 million people are living with varying forms and measures of disability in America alone! Around 20 million people have varying degrees of trouble in lifting or gripping, more than 8 million people have problems with their vision, and more than 7.5 million have a hearing disability. Did that get your interest piqued? However, it is only natural that you feel a little overwhelmed by the kind of effort, investment and resources this might entail. Let’s get that concern taken care of, then. Did you know something as simple as captioning in the videos helped engagement to the degree that it increased mobile video viewership by more than 500% since 2012! The seven suggested steps in the direction of incorporating app accessibility. Every journey starts with a single step and we have seven for you! Though we are listing the seven steps out for you, you need not follow the order in which we have listed them out. On the completion of all seven steps you would have built an app that would definitely be more accessible, developed an understanding of the benefits of app accessibility, a vision of the steps that you’d need to take further, and a clearer vision of the journey ahead. So, here we go! It is important that you develop an understanding about the various kinds of disabilities and the ways in which they impact the users’ ability to use the app. Given the fact that you are looking into ways to make your app accessible, you might already have a moderately accessible app in your hands. Hence, it would be wise to run your app for a quick accessibility check. In case your app is entirely inaccessible, it probably has something to do with the technology that was used to build it. In such a scenario the app should be reviewed by a professional testing body who might be able to offer you advice on a practical way to move ahead. However if the app is accessible but not as much as you would like it to be, then these steps can definitely help you improve it. The intent of publishing an accessibility statement is to announce your commitment to accessibility. This statement will help you define this very intent of your app to be made available and be usable by the greatest number of people irrespective of their abilities or disabilities. It is possible that not all the elements of your app are as accessible as you’d like them to be, but that’s quite OK. Let the statement reflect that you are working to improve the situation and would appreciate feedback from the users or experts in the arena. This will help you prioritize and categorize the changes that are still needed. Conducting quick tests and enhancing them on the basis of the testing you do on your app can’t be enough for you to be sure that your app is accessible. There would always be a scope for improvement and the genuine feedback from the real users is of great importance in this regard. When you include a ‘Contact Us’ feature for the users, they can reach out to you with ease and let you know wherever there is a scope for any improvement. It is important that the experience of accessing and utilizing the app be simple and convenient for all the users including those who would be using a screen reader. This means that the information on the screen should be read in a logical sequence including input fields, the images should have a description, all the controls within the app must be described correctly, and the acronyms or any special symbols must be implemented in a way that they can be read correctly. The user interface and the user experience are prime factors in determining whether your app can be a success or not. 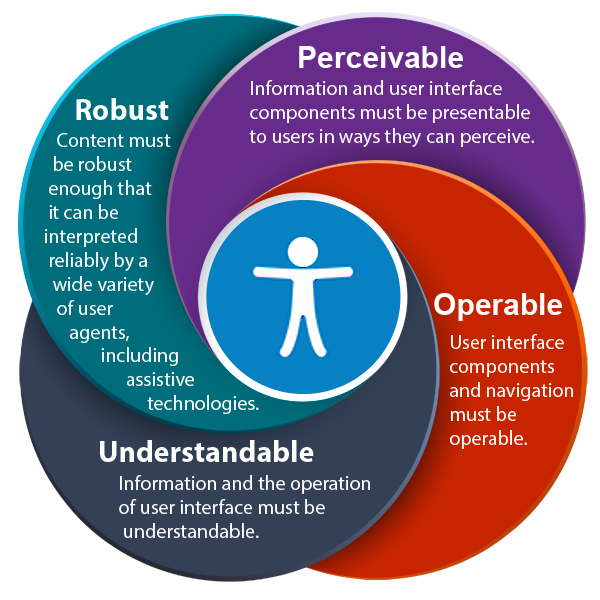 Though accessibility encompasses a number of different factors, but understandability and operability are two of the most important aspects and form the foundation. It is important to keep the layout simple and sparse in the interest of accommodating a variety of devices and operating systems. This is especially relevant for the apps that have a great amount of text placed on the screens like eBooks, eMagazines, ecommerce apps that have detailed product descriptions etc. the user must be able to adjust the font size, font type, font color, or the background color to make the content legible. Following these first 7 steps will help you make the apps more accessible, but this is not the end of the journey. A features checklist to help you meet the WCAG standards. The WCAG or Web Content Accessibility Guidelines are responsible for setting the standards of making the web content more accessible as per the needs of different people. Here is a simple representation of WCAG 2.0 principles to help you understand them. Following is a checklist that we, at Appy Pie have formulated for those who want to develop an app with prime accessibility for all users. Any non-text content whether it is still images, videos, or GIFs is not going to be of any use to the visually impaired. Hence, it is important that you take measures to provide some kind of text alternatives otherwise you might end up alienating this whole chunk of potential users or customers. The visually impaired people often rely on text to speech voice technology to use their phones and you must consider this clientele while designing your app. Providing captions is not enough. These captions should be so placed with the videos that they sync up perfectly with the audio so as not to have any kind of time gap. This ensures that all users derive quality experience from the content of your app. The users should be able to view the content of your app by rotating their devices between both portrait and landscape format without losing out on any information. This means when a user has to change the orientation of the device, they shouldn’t lose visibility of any content on the screen. If your app requires the users to scroll, zoom, or perform any other action to view the same content when they change the orientation of the device, your app wouldn’t meet the WCAG standards. Refer to the stats we mentioned earlier about the number of color blinded people. It affects 8% of the total male population and 0.5% of the female population. Now, you need to make sure that your app has the ability to accommodate this percentage of the population as well. One of the most important things to do here is that on each screen there should be a clear separation between the foreground and the background. Also, do not use conflicting colours together as people who are colourblind will not be able to process them. The larger intent here should be to make sure that every screen is as readable as possible, irrespective of who is using it. Some of the apps may have certain features that are not fit for use by everyone. In case there is an element in your app that has light flashes or a quick succession of a number of images, it might cause seizures! It is better to remove this from your app entirely or have a provision to switch that particular feature off. However, as a principle avoid flashing lights or color backgrounds that are changing continuously. The app must allow the user sufficient time to go through the content and read the material on your app, or have an option for the material to be read out to them. If the page is timed out after a definite period, they might lose their spot on the page and have to go through it all over again leading to annoyance and frustration. A well-designed app would have clear indications about the function of each button or link on it. Also, it is important that the buttons are all properly differentiated from one another with different colors. However, you may do well to use other defining features like bold, underline, size variation etc. to accomplish this. It is true that most of the devices have the option to change the size of the text, brightness and the color of the screen, but it is better to incorporate these features in your app as well. You can do this simply by including a slider bar or something similar where the user can adjust the settings according to their convenience. In providing this flexibility you also have to make sure that your app retains its visual appeal and format you designed it to have. Mobile apps and mobile technologies are the future and are only going to get more sophisticated in the times to come. Pay attention assistive technologies that seems to progress and would keep doing so for some time in the future. Leave some scope in your app for future compatibility with these technologies. Not only should your app be able to accommodate the current technologies but have enough bandwidth to do so in future as the technology evolves. It might seem like a daunting task today but trust us when we tell you that it is totally worth it! Not only will it give you the satisfaction of doing the right thing, but also broaden your scope and open your app up to an expanded audience. There might be certain people who wouldn’t have downloaded or used your app earlier, just because they couldn’t. Once you have incorporated everything on this checklist on to your app, you begin your journey to making an app that would be worth using for everyone!